Did ‘El Chapo’ Testify That He Gave Millions to Pelosi, Schiff, and Clinton? Drug kingpin Joaquín "El Chapo" Guzmán testified that he gave millions of dollars to Nancy Pelosi, Adam Schiff, and Hillary Clinton. The claim that El Chapo testified in court that he gave “Killary” Clinton, Pelosi, and Schiff millions of dollars did not originate with a news report, a courtroom transcript, or from anyone with inside knowledge about this case. This claim appears to have originated with a baseless Facebook post from “Shane Vandiver,” the bassist and singer for a Texas music group. 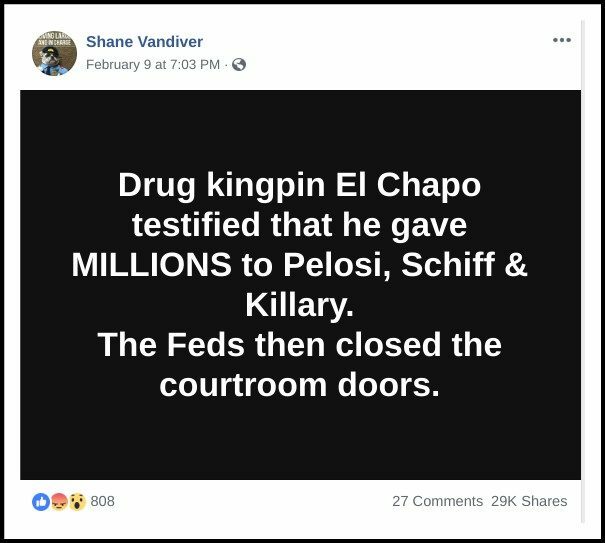 On 9 February 2019, Vandiver posted the message to his Facebook page: “Drug kingpin El Chapo testified that he gave MILLIONS to Pelosi, Schiff & Killary. The Feds then closed the courtroom doors.” It was the earliest (and most popular) iteration of this message that we could find. 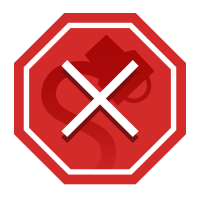 Vandiver’s post was not presented with any supporting evidence. He did not include any links to news articles, videos, interviews, or transcripts. His post was also suspiciously void of specifics, such as how much these politicians were paid, what they were paid for, and how these transactions were completed. This claim is not based on any factual information. It was made up in an apparent attempt to stir up controversy and smear Democrat politicians. This rumor is also suspicious for another reason: El Chapo did not testify during his trial. El Chapo was extradited to the United States in January 2017 to face a litany of criminal charges, including money laundering, drug trafficking, firearms violations, operating a criminal enterprise, and conspiring to murder rivals. When his trial officially began more than a year later in November 2018, prosecutors talked to more than 50 witnesses over 11 weeks to lay out their case. (Associated Press): Mexican drug lord Joaquin “El Chapo” Guzman told a judge Monday that he won’t take the witness stand in his own defense at his U.S. drug-trafficking trial, ending speculation that he might go for broke and build on a notorious reputation already cemented by the sprawling government case against him. “Your honor, me and my attorneys have spoken about this . and I won’t testify,” Guzman said through a Spanish interpreter in a rare instance of him standing up and speaking in court. (Reuters): Accused Mexican drug lord Joaquin “El Chapo” Guzman said in court on Monday that he will not testify in his own defense at his U.S. trial. Guzman announced his decision after prosecutors rested their case against him in federal court in Brooklyn. After excusing the jury, U.S. District Judge Brian Cogan asked Guzman directly whether he understood it was his decision, not that of his lawyers, to testify or not. “Yes, but they counseled me about it and I agree with them,” Guzman answered. Had Guzman, 61, testified, it would have provided a fitting climax to an already dramatic trial. However, Guzman’s decision was widely expected, as testifying would have exposed him to cross-examination by prosecutors. 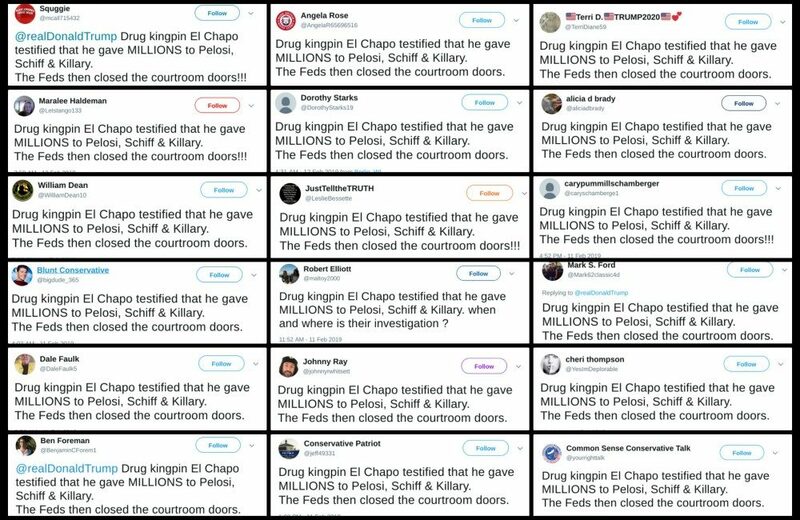 In other words, El Chapo couldn’t have testified that he gave millions of dollars to Clinton, Pelosi and Schiff because El Chapo did not testify during his trial.